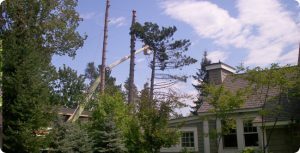 Antler Tree Service has specialized in dangerous tree removal for over 30 years. We understand the last thing our client needs is damage or injury occurring from an already dangerous situation. We have assembled a safety-trained, professional team of experts to handle these unforgiving situations. You can be assured your needs will be met to your satisfaction while keeping safety and your property as our number one priority. We at Antler Tree Service fully understand what a beautiful tree does to the landscape. Not only does it give us personal pride to know we have done a good job, we know it will not only increase our clients property value. It will bring many years of health, beauty and memories to the owners’ landscape. Proper trimming and shaping of trees makes for a healthier tree. It brings out the tree’s personality, reduces wind and weather effect. It shows the community you take pride in your property. If you have questions on any subject from fruit tree trimming to hedges, please give us a call. Just purchase a new cottage? Your old cabin has grown into the shadows? Your once beautiful view of nature’s sunset has disappeared into the underbrush and low hanging limbs? From Minnesota to Wisconsin and throughout Michigan, we have been restoring our customers to the very thing that lured them to the purchase of their properties: a scenic view. Knowing trees are an important part of our ever-changing environment, it is our duty to keep our landscape healthy. Many times after a visit with our clients we are able to formulate and put in place a working plan that will not only restore your scenic view. It will enhance health and value to your existing property. Proper thinning techniques, selective harvest of less desirable trees, and directional trimming when done correctly will give years of long lasting views of sunsets and nature’s beauty. Mother nature can only do so much. We will do the rest. Lot cleaning and construction site preparation are always a finely choreographed dance. What trees should stay, what should go, as well as what has to go to make room for the construction project. This is where we come in and help decide what may be right for your long-term investment. Large old growth oaks certainly should be a priority whereas jack pine should certainly be removed. The trees coming down should never be dropped or fallen into or onto trees intended to stay–it is always nice to keep and protect what you already have. Now if you are putting in a parking area or perhaps a large security fenced area, we do complete tree and stump removal. 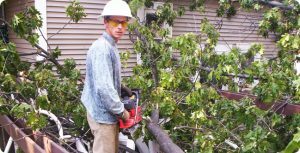 Here at Antler Tree we have heavy machinery, professional operators, large heavy duty stump grinders, brush chippers and clam lift travels that will handle wood brush and debris from all sites. Fruit tree trimming is a science in itself. Most fruit tree trimming should be done while the tree is in its dormant stage. 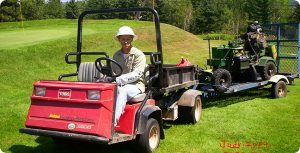 When most people call Antler Tree Service for fruit tree trimming, they are pertaining to apple tree trimming. Fruit trees consist of many other varieties and spices of trees as well. Many ornamental trees such as flowering crab apple trees, mountain ash and Russian olive trees fall under the fruit tree guidelines. Fruit trees can often be trimmed to increase fruit production, to thin the canopy, as well as to lower the fruit crop to put the fruit within reach of the consumer to make for easier picking. One of the biggest problems with improper pruning and trimming of fruit trees is the explosive growth of suckers and water sprouts after trimming. This reduces fruit production and drains the tree of its natural vitamins and nutrients. 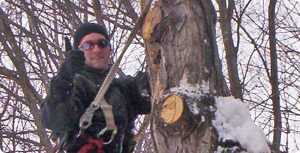 Anyone wanting organic fruit crop without the addition of a manufactured fertilizer will certainly want to allow a professional arborist to trim and shape their wild fruit trees. Our employees attend many classes to stay on top of the latest techniques to offer our clients with the most improved, updated trimming procedures in the business. We operate both small and large grinders. The small grinders are used to get into gated back yards and areas that cannot be accessed with a truck. They are self propelled and will not damage the lawn as they pass over. The large grinders are attached to the back of a pick up truck and are used when there is easy access to the stump. High winds with saturated soil, have taken down thousands trees in the Upper peninsula. We have the equipment to clean up and repair your property. Service available in Marquette City. 26 years of experience keeping your sidewalks and driveways open. Holidays, weekends, and special appointments are not a problem. You can call anytime, day or night. Get on the schedule, or call when you need help, We will be there.